Lemon cake is a common item as an offering on home altars during the Shiimii and Obon seasons. The cake is shaped like a lemon that gives it its name. It’s a sponge cake covered with lemon flavored icing, very simple and reasonably priced, and available at almost every grocery shop on the island. According to an urban legend, lemon cakes were first made by Chiyoda Metal Industry Co. in Tokyo, Japan, because they made lemon-shape baking pans and people started ordering cakes from them, too. Lemon cake was at the peak of its popularity from about 1965 to 1975. 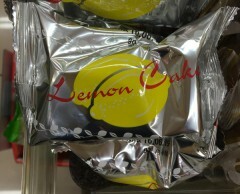 Convenience store Lawson recently started selling lemon cakes made to be eaten with a spoon.